The designer villa 'PineCliff' is located directly by the sea; private overflow pool with large patio, exceptional view, 600 m from the exclusive golf course 'Korineum' . 3 bedrooms, 2 bathrooms, designer furniture, Bosch kitchen appliances. Electronic air conditioning in the bedrooms. Spacious, shaded patios. Mediterranean garden with olive trees, pine, blooming shrubs; enclosed property. Ideal for golfers and guests, value the nature, rest and relaxation. Sport options: Guests at the Villa PineCliff can play tennis in the neighboring resort free of charge, the fitness facilities, a small mini golf course and large chess can also be used free of charge! Golfers receive a discount on green fees at the neighboring golf course! Top location: The villa is located in an absolutely peaceful location. The stunning sea view (beachfront) and the close proximity to one of the most beautiful golf courses on the Mediterranean make this villa a 'top location'. Guide/street maps/family games: During your stay you can use the newest tour guides in German and English in the villa, just like detailed street maps and event calendars. We will try to expand the selection of family-friendly board games regularly. Towels available, each bathroom with window. The villa was furnished with a high level and with a lot of attention paid to detail and thus offer the perfect atmosphere for relaxing holidays. The electric appliances in the kitchen are Bosch quality products. Fantastic Holiday. One of the best. This villa was peaceful, tranquil and the most amazing views. the kitchen was well equipped. The pool was very well maintained. You need a car. Recommended restaurants Manipeni in Girne take a 1st right on biggest roundabout about 25 mins away. Buffalanto go towards Girne and take a left at junction up to the mountains they give you blankets if its chilly and Stone castle take a left out of estate about 6 mins drive. Would recommend SAR supermarket going towards Girne fresh cakes and fresh ready made salads to pick your own choices. I would definitely go back some day and possibly stay a lot longer. The food is far more traditional Turkish dishes. It is so cheap. Crossing the borders was really easy. I could go on for ever as to how enjoyable and relaxing this holiday was. I was a single mother with 3 grown up children so the excellent wifi was also a great asset. 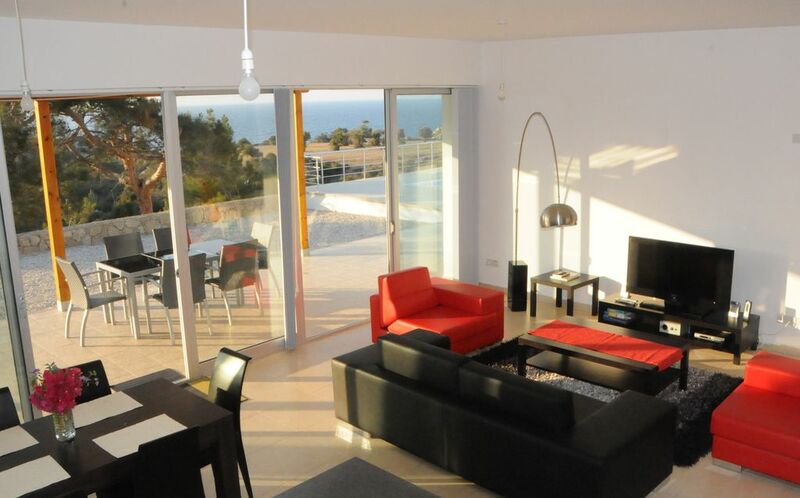 Overall this property is fabulous, the pool is wonderful and panoramic sea views are exquisite. The property is looking a bit tired in places and there were a few things that the management company didn't manage to fix in the 2 weeks we stayed at the villa - broken door handle, leaking kitchen sink, and no hot water in the kitchen however these didn't really effect our stay in the villa. Looking forward to welcoming you again!! Great villa, great views, but worn and not very clean. The villa has a quiet location with super views to the ocean and a perfect pool. It is worn and was not perfectly clean wheb we arrived. The pool needed cleaning beford we could use it, but the owner reacted fast when we told her and Got it fixed next day. Villa light and airy excellent large pool and peaceful location with good local restaurants and stores. We were able to explore the sights of Northern Cyprus Girne, Famagusta, Bellapais, Nicosia, Salamis and Karpasia Peninsular with good roads and empty beaches. Minor issues were attended to Villas Resco agent. Whish you all the best! If you are looking for a very relaxing holiday, modern spacious accommodation, fabulous pool, wonderful views of the sea, a mountain backdrop and provides the opportunity for outdoor living, Villa Pinecliff is perfect. The villa is well equipped with the essential items to make your stay very comfortable and its location enables you to discover the northern coastline with ease. I would recommend a visit to Bellapais Monastery near Girne and the Korineum Golf and Country Club, a 5 minute drive from the villa provides excellent golf facilities. We had an amazing holiday this summer at villa PineCliff with fantastic views over the bay and quiet neighborhood, close just 5 mins walk to beach. All 3 bedrooms are air-conditioned but not for the living room but we did not bother because we spent all our times on the terrace and pool. Pool was cleaned and serviced during our stay. Although villa was not advertised as wheelchair friendly it was fully accessible for us on the lower ground so it suited our need for our daughter in manual wheelchair. Nicely decorated and kitchen and all interior / exterior space fully functional and well maintained. The managers were very prompt to solve small issues and they were very friendly and available at all times.weather too perfect,. A car is recommended . All in all it was a fantastic holiday which we honestly recommend. Thank you so much for your feedback. According to your suggestion we will put a removable ramp at the entrance as soon as we get to our place next time. This should help wheelchair users to cross the small step from the alley to the front door paving easily. The villa is located in the first row (beach front) in a peaceful village settlement near Esentepe (Northern Cyprus), 18 km east of Kyrenia (Girne), 600 m from the entrance to the golf course (Korineum Golf & Country Club), one of the most beautiful on the Mediterranean Sea. Wonderful view of the nature and sea, private pebble beach about 200 m away. Usage of tennis courts and fitness facilities of the neighboring resort. Multiple lonely beaches nearby, mini market on foot, shopping centers can be reached in a few minutes drive. The central location of the villa allows for you to discover many historical treasures nearby (harbour and old city of Kyrenia, Bergburg St. Hilarion, Barnabas-monastery, Bellapais abbey) or daily excursions (Famagusta, Salamis) and to dive into a world full of enchanting landscapes. Through 5 border crossings you can easily get into Greek Cyprus. Distances: Nikosia 50 km, airport Larnaca 102 km, Ercan airport 50 km. Golf: The villa is located 600 m from one of the most beautiful golf courses on the Mediterranean, the Korineum Golf & Country Club (www.korineumgolf.com), an 18 hole championship golf course. Renters of the villa 'PineCliff' receive a green fee discount at the Korineum Golf & Country Club of about 6 BP per game and player. The golf course 'Korineum' has become a 'secret tip' for true golfers. Flexible An- und Abreisezeiten! Wir sind bemüht, Ihren Aufenthalt so angenehm wie möglich zu gestalten. Daher passen wir die Ein- und Auscheckzeiten - wenn möglich - gerne Ihren Flugdaten an. Hausverwaltung vor Ort: Für die Schlüsselübergabe und die Reinigung ist die Hausverwaltung Resco zuständig.